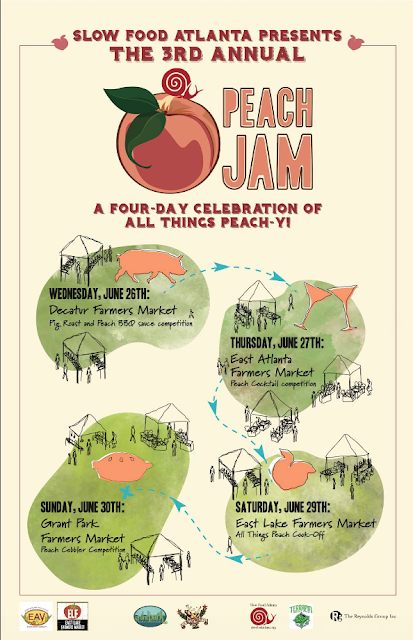 Look to your nearby farmer's market for Peach Jam 2013 events [http://www.farmatl.org/events/peach-jam-2013/]! "PEACH JAM 2013 is a four day celebration of Georgia's favorite fruit, the peach, brought to you by Slow Food Atlanta and Community Farmers Markets. Guest attendance is free at all events. Samples of each category can be purchased at the markets on the day of the events. This registration is for competitors only. Pig Roast and Peach BBQ sauce competition at the Decatur Farmers Market. Professional level entrants, limited to 25 participants. Registration is $25 and includes peaches. Cocktail competition conjunction with the Midway Pub and the East Atlanta Farmers Market. Professional level entrants, limited to 25 participants. Registration is $25 and includes peaches. Peach cook-off (all things peach) at East Lake Farmers Market. Amateurs and professionals welcome, limited to 25 participants. Registration is $25 and includes a bag of peaches. Cobbler Competition, parade, and festival games at the Grant Park Farmers Market. Amateurs and professionals welcome, limited to 25 participants. Registration is $20 and includes peaches. All recipes should include fresh, Georgia Peaches. Prizes vary based on event, but include fame and fortune! Individual event details will be emailed after registration. Questions? Contact peachjamatlanta@gmail.com"